Opposition presidential candidate Solih receives a 'colorful' welcome from Raa atoll islands. The central Raa atoll is famous across Maldives for its grandeur celebration during the Islamic festive periods of both Eid-ul-Fitr (immediately after the sacred month of Ramadan) and Eid-ul-Adha (following the holy Hajj pilgrimage). 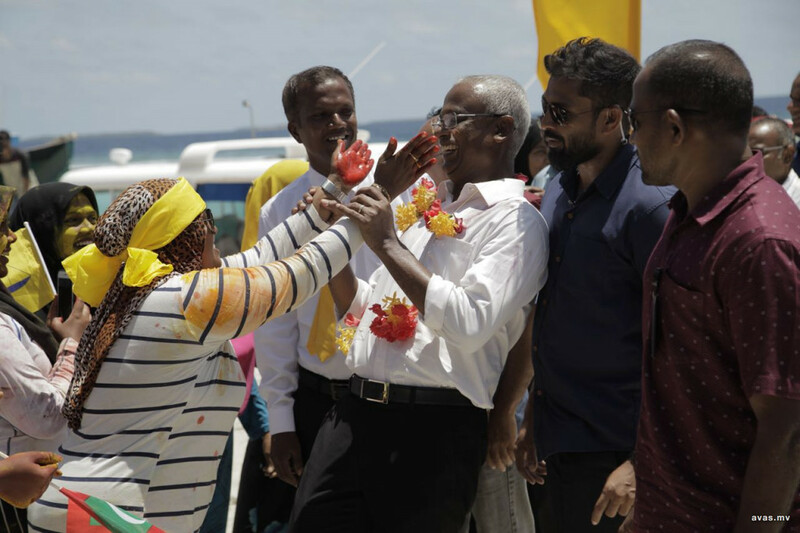 The story becomes attached with opposition presidential candidate Ibrahim Mohamed Solih as he arrived in Raa atoll on Thursday for campaign visits. 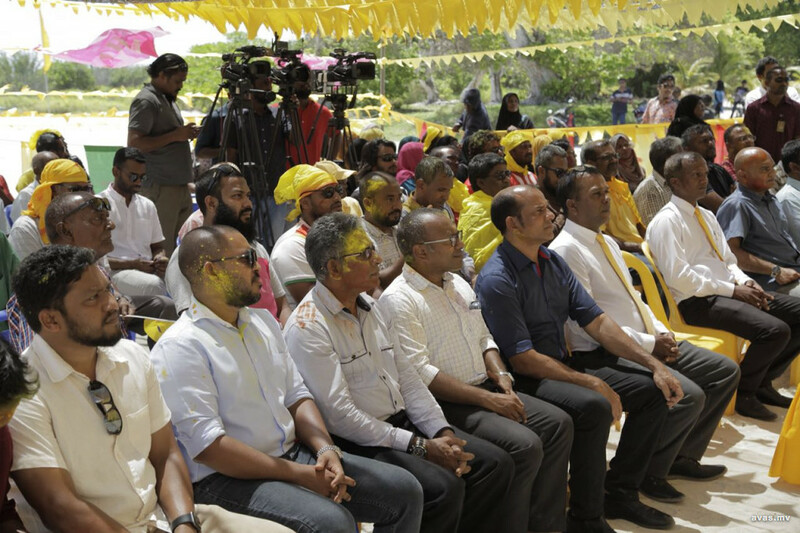 His campaign trip itinerary to Raa atoll first led him to Hulhudhuffaaru where an unexpected Solih was in joyous fashion 'attacked' with the color yellow (the representing color of Maldivian Democratic Party to which he belongs). Solih next visited Raa atoll An'golhitheem after concluding his visit to Hulhudhuffaaru. Much like his previous destination the opposition presidential candidate was once again graced by harmless dashes of dry colors. The opposition presidential candidate's companions had also fared the same from their supporters from the island who had thrown puffs of dry colors at them upon arrival. Solih has already visited three of the inhabited islands of Raa atoll while he is scheduled to visit the islands Vaadhoo and Alifushi later on Thursday. The MDP endorsed candidate will be visiting the islands Un'goofaaru, In'guraidhoo, Fainu, Kinolhas and Dhuvaafaru of Raa atoll on Friday. The day after he is expected to grace Maakurathu, Rasmaadhoo, Innamaadhoo, Maduvvari and Meedhoo of the same atoll. While the entire Maldives is currently celebrating the Muslim festive season of Eid-ul-Adha, it is highly expected the opposition presidential candidate may receive similar welcoming receptions from his planned destinations.